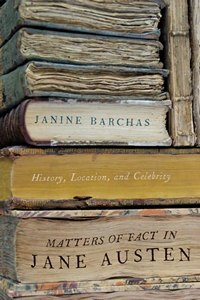 In Matters of Fact in Jane Austen: History, Location, and Celebrity, Janine Barchas makes the bold assertion that Jane Austen’s novels allude to actual high-profile politicians and contemporary celebrities as well as to famous historical figures and landed estates. Barchas is the first scholar to conduct extensive research into the names and locations in Austen’s fiction by taking full advantage of the explosion of archival materials now available online. According to Barchas, Austen plays confidently with the tension between truth and invention that characterizes the realist novel. Of course, the argument that Austen deployed famous names presupposes an active celebrity culture during the Regency, a phenomenon recently accepted by scholars. The names Austen plucks from history for her protagonists (Dashwood, Wentworth, Woodhouse, Tilney, Fitzwilliam, and many more) were immensely famous in her day. She seems to bank upon this familiarity for interpretive effect, often upending associations with comic intent. 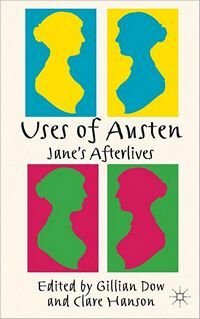 Barchas re-situates Austen’s work closer to the historical novels of her contemporary Sir Walter Scott and away from the domestic and biographical perspectives that until recently have dominated Austen studies. This forward-thinking and revealing investigation offers scholars and ardent fans of Jane Austen a wealth of historical facts, while shedding an interpretive light on a new aspect of the beloved writer’s work. Janine Barchas is an associate professor of English at the University of Texas, Austin. She is the author of Graphic Design, Print Culture, and the Eighteenth-Century Novel. Near its heart, English Romanticism—across many writers—acknowledges and celebrates a community that is not just secular but that derives meaning from a religious association and, in fact, a particularly defined religion, that is, Anglican Christianity. 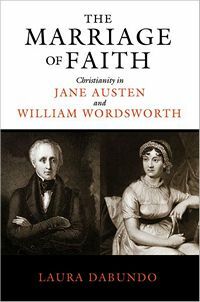 William Wordsworth and Jane Austen, premier English Romantic poet and novelist, were baptized, confirmed, and buried (and for Wordsworth, married) in conformity with the Church of England. Of course, Wordsworth’s commitment flagged in his twenties, but with marriage and responsibility came respectability and parishioner status. However, most twentieth-century critics interpret these writers’ works outside the Christian realities with which their lives were much imbued, except for late Wordsworthian poems from his purported decline into conservative politics and religion and evident poetic senility. Jane Austen did not live long enough to have a late decline, but critics have nonetheless overlooked her faith. It is not necessarily the surface of her writing, but Christianity is unquestionably the sea out of which her characters arise, her plots bubble up, and her themes unfold. It was her and their reality. Notwithstanding this negative or blind critical precedent, Laura Dabundo highlights what most readers are conditioned to disregard, the ways in which the church saturates the writing of Wordsworth and Austen. The Church of England’s liturgy has traditionally been based on Scripture, which these writers would have known. This book, then, links their faith to their works. Laura Dabundo is professor of English and coordinator of Religious Studies at Kennesaw State University. She is editor of The Encyclopedia of Romanticism: Culture in Britain, 1780–1830s and Jane Austen and Mary Shelley and Their Sisters: Romantic Women’s Fiction in Context and has written articles on many Romantic writers. Born in Philadelphia and educated in Pennsylvania, she teaches British Romanticism, the Gothic, the Bible as Literature, Mystery and Detective Fiction, and editing. Currently, she is studying Irish Romantic writers and their faith. This collection of essays focuses on the ways in which the life and work of Jane Austen is being re-framed and re-imagined in 20th and 21st-century literature and culture. Tracing the connections between the construction of a Modernist Jane Austen in the early 20th century and feminist and post-feminist appropriations of her texts in the later 20th century, the essays in this volume also examine the ways in which Austen has more recently emerged as a complex point of reference on the global stage, her novels being adapted in settings ranging from Amritsar to California, her name being invoked in political discourse on internet sites and in the printed press as shorthand for English or more broadly Western liberal cultural values. 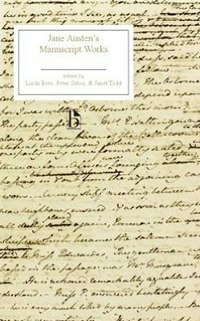 The volume is distinctive in its international scope, and in its focus on Austen as a dynamic cultural signifier. Together, the essays explore the richness and complexity of the cultural encounters generated through re-inscriptions of an imagined ‘Jane Austen’, and ask what they can tell us about contemporary desires for cultural authority and authenticity. Gillian Dow is Lecturer in English at the University of Southampton, UK, and Director of Research at Chawton House Library. She has published on French and British women’s writing of the Romantic period, on translation, on the reception of foreign literature in Britain, and on the cross-channel rise of the novel in the long eighteenth century. Clare Hanson is Professor of English at the University of Southampton, UK. She has published extensively on twentieth century women’s writing, is a founding member of the Contemporary Women’s Writing Association and co-editor of the journal Contemporary Women’s Writing. Her most recent books are A Cultural History of Pregnancy (2004) and Eugenics, Literature and Culture in Post-war Britain (2012). Linda Bree is Editorial Director, Arts and Literature at the Cambridge University Press and the editor of the Broadview Edition of Jane Austen’s Persuasion. Peter Sabor is Professor of English and Canada Research Chair in Eighteenth Century Studies at McGill University, and the editor of the Broadview Edition of Sarah Fielding’s The History of Ophelia. Janet Todd is President of Lucy Cavendish College at the University of Cambridge and the editor of the Broadview Edition of Charlotte Smith’s Desmond. « Q & A with Jane Austen Made Me Do It Authors: Question 7 & Giveaway! Thank you for this list. I am going to print it and get all of these books. These books look very interesting. I love the new take on research on Jane. I’ll definitely have to check them out!